Hiya guys! It's that time again to entice you with some polish. But before I do, I have to tell you a little story. 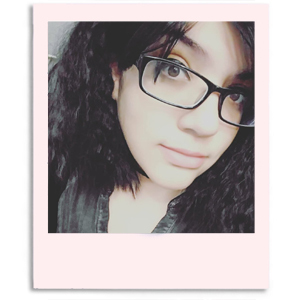 So you know by now my camera died and took my SD card with it... and my photos. This was one of the collections I ended up swatching twice, haha. I can't lie and say it wasn't frustrating (and hella stressful), but this was probably one of the easiest collections to have that happen with. The day is finally here though! 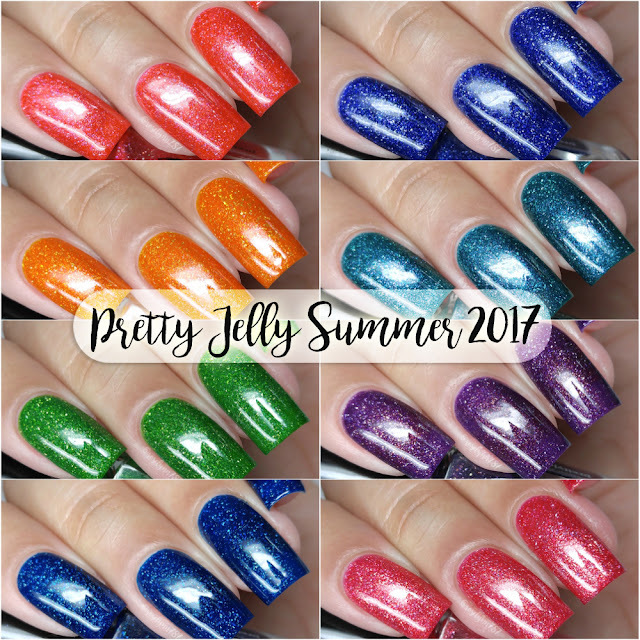 And today I'm sharing swatches for the Deep Sea Jelly Collection by Pretty Jelly Nail Polish, which consists of eight gorgeous and bright jelly shimmers. This is a large collection, so fair warning because there are a lot of photos ahead! Let's get to it! The Deep Sea Jelly Collection by Pretty Jelly Nail Polish is now available for purchase. Each full-size 12mL bottle retails for $10 and each mini-size 6.5mL for $5.50. The full collection can be purchased for $80 or in mini-size for $44. Atolla can be described as a coral red jelly with green and blue/violet to magenta shifting shimmer and holographic flakies. The formula has a sheer application as intended for a jelly-finish. After some layering there is still some visible nail line, but it's more evident in person. Dries down to a minimal gritty finish that smooths out nicely after topcoat. Shown here in three coats and sealed with a glossy topcoat. Bluefire can be described as a blue jelly with golden green shimmer and holographic flakies. Isn't this breathtaking?! There is just something magically about the combination of the holo and flakies, which you'll see a lot of in this collection. It simply creates a gorgeous degree of depth and dimension in the finish. The formula has a sheer application as intended for a jelly finish. It has a great smooth consistency, making it really easy to work with. It dries down to a high-shine and minimal gritty finish. Even though it's a very prominent blue, I experienced no staining to my nail beds or cuticles. Shown here in three coats and sealed with a glossy topcoat. Crown can be described as a bluish purple jelly with green and pink shimmer and holographic flakies. The formula has a really nice opaque application, much more than I expected. Consistency wise it leans on the thin side, but it's very manageable to work with. I did experience some minor staining on removal to my cuticles, to me it was nothing too concerning though. I was able to easily clean it up after some scrubbing. Shown here in two coats and sealed with a glossy topcoat. Flower Hat can be described as a raspberry pink jelly with fine green and gold to blue shifting shimmer and holographic flakies. The formula has a good opacity for a jelly, but it's still sheer enough to need layering. It has a really great balanced consistency, not too thin or too thick. Shown here in two coats and sealed with a glossy topcoat. The formula has a similar application as the others in this collection. Starts off sheer, but it builds up nicely for full coverage. Smooth and easy consistency, not too thick or too thin. It dries minimally gritty, but smooths out perfectly after topcoat. Shown here in three coats and sealed with a glossy topcoat. Mauve Stinger can be described as a red-toned purple jelly with copper and gold shimmer and holographic flakies. This one has the best example of what I mentioned before with the flakies and holo. They work together so seamlessly to create a really stunning finish. Really photos don't do that gold shimmer justice. The formula has a very sheer application as expected. It builds-up lightly, but does give that full coverage but look like the others. Consistency leans on the thin side, but it's manageable There was no staining on removal and it dries minimally gritty. Shown in three coats and sealed with a glossy topcoat. Porpita Porpita can be described as a teal jelly with red and pink to gold shifting shimmer and holographic flakies. The formula has a sheer application with a fair amount of opacity. It builds up quite easily and has a great consistency, very balanced. I experienced no staining on removal to my nail beds or cuticles. Shown in two coats and sealed with a glossy topcoat. Victoria can be described as a grass green jelly with red and pink to gold shifting shimmer and holographic flakies. The formula has the same great application and consistency as the others. Great build-up all around for full coverage. There is a visible nail line, but only very faintly in direct sunlight. It dries down gritty and smooths our nicely after topcoat. Shown here in two to three coats and sealed with a glossy topcoat. Overall this entire collection feels like a dream and is completely a must-have. I am living for these bright and fun colors, it has that tinge of uniqueness for the summer as well. It's a very consistent collection in terms of formula, which is always such a immense pleasure to experience. It definitely says a lot about a makers capability for creating a cohesive collection. It's hard to pick favorites in a sea of favorites, but if I have to pick Porpita Porpita and Fried Egg are my must-haves. Now tell me which ones have you going ga-ga?! To recap, the Deep Sea Jelly Collection by Pretty Jelly Nail Polish is now available for purchase. Each full-size 12mL bottle retails for $10 and each mini-size 6.5mL for $5.50. The full collection can be purchased for $80 or in mini-size for $44. So. much. Goodness. I am a sucker for those tiny holo flakies.